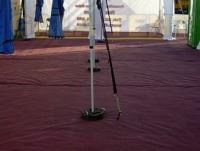 Why choose Gala Outdoor Flooring? 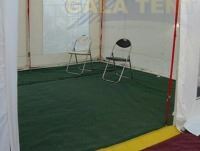 Gala-Tex outdoor matting If you need to create instant and attractive flooring, then roll out the Gala-Tex. Gala-Tex is strong and durable, and is supplied in either green or burgundy. Gala-Tex is gloss coated to minimise dirt retention, and the coating makes it easy for you to wash down and clean. Gala-Tex is a breathable fabric and is ideal for use on grass – for example, you could use it for camping, awnings, gazebos or marquees. 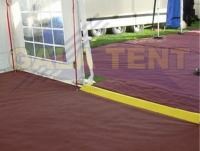 Gala-Tex is also the matting of choice for trade shows, event walkways and similar applications. Please note that Gala-Tex is only available in 3m widths, therefore sizes with widths greater than 3m will come in multiple pieces.